Ingenious placement--for Timex. I'm not sure about Germany, but here in the U.S., people who can afford a $12,000 watch typically spring for cab fare when their chauffeurs are on vacation. 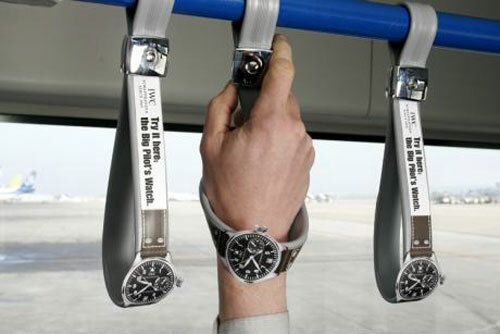 Ingenious placement--for Timex. I'm not sure about Germany, but here in the U.S., people who can afford a $12,000 watch typically spring for cab fare. When their chauffeurs are on vacation, that is. I know where you can get a "genuine" fake IWC for just over a hundred bucks. I also know where you can get a "genuine" fake German bus for a grand. I know everything! Know I know exactly how those bus straps are supposed to work. Promotional and educational, I like.